The basis is a manual TATRA transmission unit which is mounted directly onto the transfer case housing, it is an integrated part of the chassis. TATRA transmission units are available in two basic versions: a fourteen-gear version (14TS) and a ten-gear version (10TS) – in combination with two-gear (in some applications also one-gear) transfer two-gearcases. Both basic transmission versions differ in the range and grading of individual gears. The TATRA transmission torque ranges from 1,400 to 2,100 Nm. The front transmission cover allows mounting of PTOs. The transfer case, bolted together with load-carrying tubes, forms an integral part of the TATRA chassis load-carrying structure. It is available in two basic versions – TRK shifting at standstill (turtle/hare) and TRS shifting when moving (used with 14-gear units). The rear transfer case cover also allows mounting of a PTO. In 2009, the offer of TATRA transmissions (selected vehicle applications) was extended by electronically controlled TATRA-Norgren gear shifting system, which is an alternative to manual control. To pre-select a gear, the driver uses a shifter. After the clutch is depressed, the gear is engaged. As an option, TATRA offers to install other manufacturers’ transmissions into its vehicles. In particular, these are fully automatic transmissions. For special projects, mainly in the Force range, a transmission made by an American Twin Disc producer is installed – a 1189 or 1177 type six-gear transmission. Its advantage is that it is directly integrated into the load-carrying tube. An independent torque converter is mounted on the engine and is connected to the transmission through a system of hoses. The Twin Disc transmissions are able to transfer torque of up to 2,800 Nm. Automatic transmissions made by Allison are also available. They extend the overall offer of transmissions. These are six- or seven-gear automatic transmissions of a compact design in one case, with a torque converter, and are mounted directly onto the engine. To transfer the torque to the chassis we use a new generation of TATRA transfer cases. The Allison transmission torque ranges, depending on type, from 1,000 Nm up to a max. of 2,500 Nm. 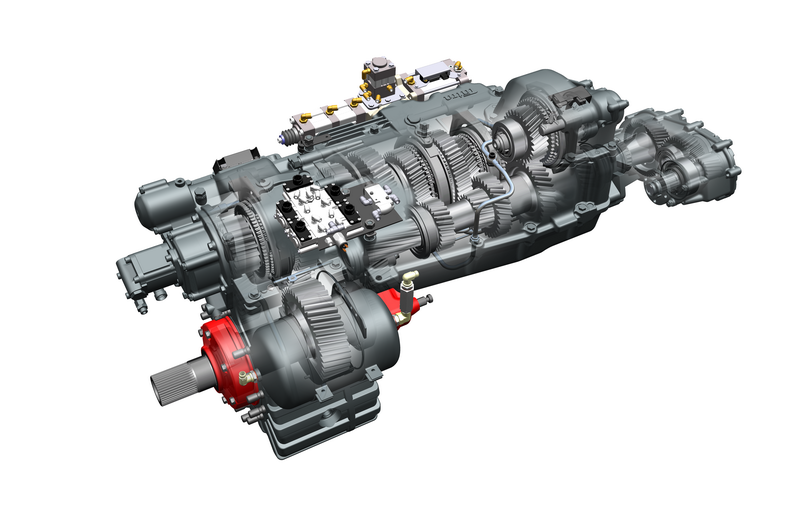 For the T 810 customer project and its civilian applications, a manual six-gear ZF Ecolite 6S 1000 T0 transmission is used. Gear change is controlled by means of Bowden cables with a pneumatic booster (up to two PTOs with outlets through the rear transmission panel). T 810 truck is equipped with a two-speed ZF Steyr VG750 transfer case with electropneumatic gear-shifting at vehicle standstill. A commercial version of the T810 enables engagement of the front axle drive; the military version, on the contrary, has an AWD system.